The United States Sports Academy is donating Vietnam War sketches and a bronze sculpture by award-winning artist Harry Weber to the USS Alabama Battleship Park during a presentation scheduled at 4:30 p.m. Thursday, May 5 at the USS Alabama Memorial Park Aircraft Pavilion in Mobile. Weber, the American Sport Art Museum and Archives (ASAMA) 2011 Sports Artist of the Year, Sculptor, honors the heroism of American soldiers in the donated works. “A Warrior’s Sketchbook” is a collection of 13 sketches from the Vietnam War. Weber’s “Wounded Warrior” sculpture depicts a citizen soldier who appears distressed and is either defiantly planting his Battle Flag or supporting himself with it. Weber, a St. Louis native, served six years in the U.S. Navy, including a year on river patrol boats in Vietnam. There he compiled a compelling series of sketches chronicling his experiences. These show soldiers in everyday life from patrolling the rivers and transporting Vietnamese prisoners to eating C rations for breakfast and stealing brief solace behind sand bags during fighting. In addition to his sketches, Weber, who earned an art history degree from Princeton University before joining the Navy, has developed more than 100 large sculpture works and more than 200 smaller pieces. His sculptures have won several major awards at national juried competitions. His works appear in private collections in the United States and abroad, on the covers of numerous national magazines and in museums throughout the country. Monumental works that Weber created of famous sports figures are prominently featured at 12 different professional and college stadiums. 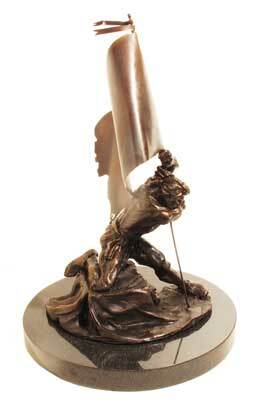 “Wounded Warrior” is a small study for a planned heroic sculpture to honor the United States citizen-soldier. The sculpture, which conveys the warrior’s unique courage and strength to carry on even in harm’s way, is meant to represent no specific branch or period of American military history, and is deliberately ambiguous in several aspects. His planting of the flag symbolizes the interdependence between soldier and country. The flag also suggests national allegiance and the bond between the warrior and his comrades. In earning the ASAMA Sport Artist of the Year Award, it is evident that Weber’s artwork captures the spirit and drama of iconic images that immortalize sport and war heroes alike.